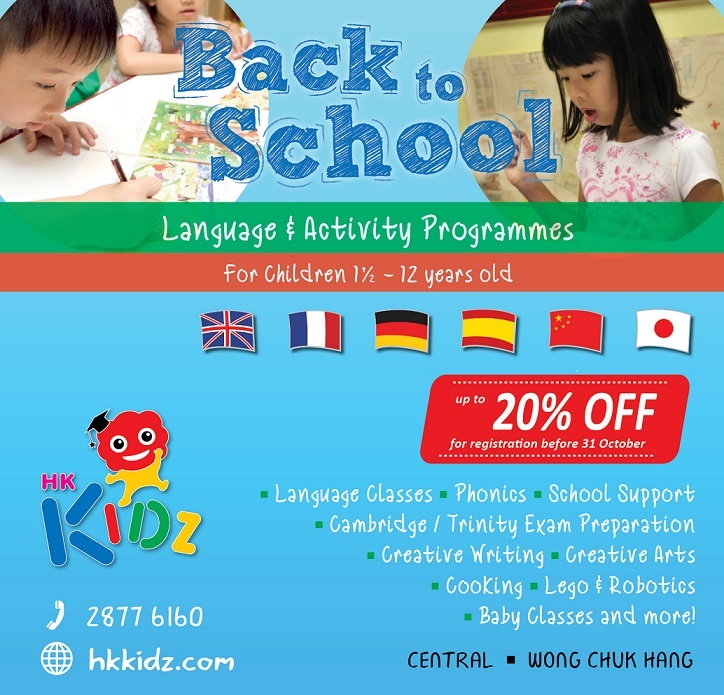 Welcome to HK Kidz Education Centre, a branch of HK Institute of Languages, specialising in English, French, German, Spanish, Mandarin and Japanese courses for children aged 1½ -12. Please visit our mobile-friendly official website : www.hkkidz.com for our most updated news and complete course details! Join our Easter Camp 16th to 26th April 2019! During this year’s holiday Easter break, the school is offering culturally-enriching language programmes in French, German and English, available for children 4 to 12 years old. Children will learn about the key aspects of each country’s culture (France, Germany and Great Britain) through language-based fun and educational learning activities. Holidays are a great time for Children to be exposed to a new language and the course content is comprehensive, including country specific festivals, cuisine, famous places, art, literature and family tree. Children who complete the Easter camp programme will have an academic advantage should they wish to enter the Beginner 1 programme on completion of the Easter Camp programme. As a parent, you want the best for your child ! For the past 30 years, at HK Kidz we have been providing children aged 1.5 to 12 with new opportunities, broadening their horizons, opening new doors with the lifelong asset of languages. We offer children a fun and engaging way to improve their language skills through stimulating activities. Our fresh, exciting and creative approach focuses on giving youngsters positive reinforcement to boost their confidence while strengthening their ability to communicate in different languages. We teach 6 languages: English, French, German, Spanish, Mandarin and Japanese. We offer a full range of courses at all ages and levels, and for every need - all taught by qualified and caring native teachers. Our classes are available weekdays after school or for the whole day on Saturday and Sunday. You can choose from our selection of small group courses (4-8 children per class) or request a tailor-made individual course for your child. Whichever course you choose, your child will benefit from a lively and well structured programme designed to bring the language to life and foster an enthusiastic and enjoyable experience. If you are looking to spark your child's creativity and imagination, we also offer culture and enrichment programmes, such as Language & Art, Music & Drama, Science & Discovery, and Cooking, Lego $ Robotics... Available in French, English, German, Spanish and Mandarin and focusing on developing curiosity and stimulating imagination, these innovative programmes offer your child the chance to develop both creative and language skills while having a fun and relaxed time. Your child will love to learn with us ! HK Kidz is one of the only language schools in Hong Kong that recruits teachers directly from abroad, which means your child is guaranteed to have real practice with native speakers - there’s no better way to learn! Groups are organised by age and level to ensure a homogenous class dynamic and optimal linguistic progress. With 6 different languages and a selection of programmes to choose from in every language, HK Kidz provides the ultimate choice for all your child's interests and needs - all under one roof. Different classes are scheduled at the same time, which means that siblings can attend different programmes or languages, in separate groups according to their age, level and area of interest, at the exact same time. Classes are available at 2 venues, all within easy reach: Central and One Island South (Wong Chuk Hang). Last but not least, classes are limited to 8 children only, providing your child with greater teacher attention and quality learning opportunities. An inspiring, fulfilling, brighter summer at HK Kidz! When is the best time to learn a language? During early childhood, children's abilities to understand, to process, and to produce language flourish in an amazing way. Learning in a fun environment further enhances the experience. As a parent, you are giving your child a life-long advantage by exposing them to foreign languages at an early age. 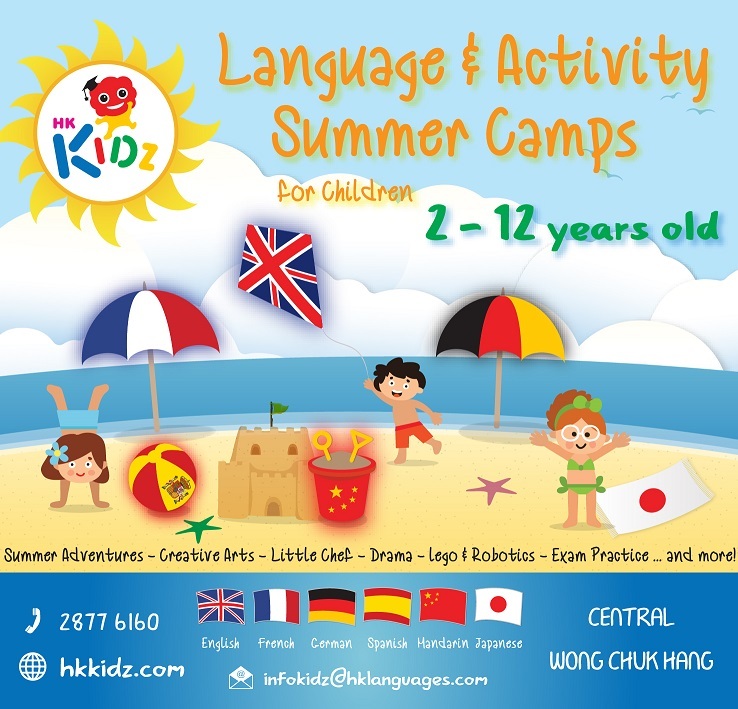 HK Kidz Language and Activity summer camps, which are available in 6 different languages, are the perfect opportunity for your child to benefit from quality language courses while being actively involved in all kinds of fun and exciting activities. By encouraging your child to explore, experience, create and interact in French, English, German, Spanish, Mandarin and (or) Japanese, these camps boost both communication skills and self-confidence naturally, effectively, and rapidly. A 3-hour summer camp, every day, over a period of 4 weeks (60 hours) is actually equivalent to 1 full scholastic year of 1.5 hours after school lessons per week. Additionally, progress is actually far greater with the benefit of daily exposure, as children won't forget between classes, as they possibly would with weekly classes. If you wish your child to become truly bilingual or trilingual, there is no better time than the summer to get them started! Are you looking to spark your child's creativity and imagination? HK Kidz also offers culture and enrichment programmes - available in French, English, German, Spanish, Mandarin and Japanese. Focusing on developing curiosity and stimulating imagination, these innovative programmes offer your child the chance to develop both creative and language skills while broadening their horizons. HK Kidz Summer camps are open to children from 2 to 12 years old. Offered in 6 languages and with a variety of options, such as Summer Adventures, Creative Writing, Exam Practice, Creative Arts, Drama & Music, Cooking, Science & Discovery, Lego & Robotics, and more, your child is sure to find a fun and interesting programme they like, making it easy for you to arrange the ideal summer schedule for your child! For example, in the morning, your child may join a French Summer Adventures class to develop their French skills, and in the afternoon, they may also take a French cooking class to further practise language while also discovering the joy of cooking. Or they may opt for an English Summer Adventures class in the morning, to enhance their English skills, followed by a Mandarin Creative Arts class in the afternoon, to develop both their artistic and Mandarin skills. There is no limit to the possible combinations. It is up to you to decide depending on your own child's needs and interests... Not to mention the convenience and time saved taking your child to one place only! With 6 different languages and a selection of action-packed programmes to choose from in every language, HK Kidz provides the ultimate choice for all your child's interests and needs - all under one roof. Half-day and full-day options make it easy for you to plan your child's schedule. You can mix and match programmes and languages, giving your child a more diversified and enriching experience. All classes are scheduled at the same time, which means that siblings can attend different programmes or languages, in separate groups according to their age, level and area of interest, at the exact same time. When joining our full-day sessions, your child stays at school and is supervised during the lunch break. Camps are available at 2 venues, all within easy reach: Central and One Island South (Wong Chuk Hang). Our programmes are flexible and can be booked on a day by day or a whole week basis over the whole summer. We highly recommend the whole week option, therefore, maximising the experience and language retention. HK Kidz Summer camps are available throughout the summer from Tuesday 3 July to Friday 31 August. Register before 31 May to guarantee a space and benefit from our "Early bird discount" of 5%! 5% discount when you register for 3 full days per week for 5 weeks or more. Additional 10% discount when you register for 5 full days per week for 5 weeks or more.